You must agree with me. I insist you agree. Wouldn't you agree steaming is healthier compared to frying?. Of course. Steaming is also simple. Add all the ingredients, steam and dish is ready. However, remember that steamed food must be eaten immediately. Otherwise, it will become mushy and bleh-bleh. Today, I'm going to share with you on how to make this steamed white pompret. Indeed a Chinese style cooking (Fried Shrimp Wanton & Chinese Prawn Fritters) and white pompret definitely is the better half of black pompret for steaming. White pompret suited for also frying whereas set aside black pompret for curries, sambal dishes and right, you can fry as well . This ladies and gentlemen is my style to this Steamed White Pompret (Grilled Salmon, Assam Fish Curry, Malaysian Indian Fish Curry, Nyonya Fish Sambal, Bengali Fish Curry, Fish Sambar, Grilled Fish Sambal Stuffed & Stingray Spicy Sauce). 1 medium (about 200g) white pomfret - de-gut and make 2 or 3 incisions on both sides. In heated oil, saute ginger and garlic till aromatic. Tip over fish placed on a steaming tray. Once cooked, pour the sauce over and garnish with coriander leaves. i love this fish. Not much bone and meat very sweet. Rather expensive though. Haven't tried this fish but it sure looks good! I love the sauce you prepared for it, Nava! Kucing - yeh, I have to agree with you but at my place, the price seems really affordable as I buy it from Econsave, maybe that's why. Tina - maybe you can't find it at Texas as commonly as its available in Malaysia. 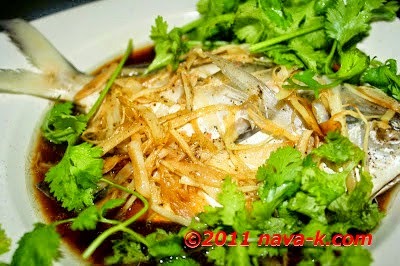 hi nava, i like bawal puteh/ pomfret, steamed as per your recipe..just have to try add chili like yours. must be tickling to my taste buds...yummy ! many thanks for your guest post, you may want to put in your final comment on the cheese platter, where the response has been great. Yeh, can be pricey I must admit. i can smell the aroma.